Our customers started calling us “the woodworker’s candy store.” It fits like an expert dovetail. KenCraft is THE destination for anyone who enjoys working with wood. People schedule trips across the country and side trips during vacations to visit our showroom. Really! Domestic and exotic hardwoods. Unique products and standard items. Tooling, moldings and pattern replication. Kits for beginners and dust collector fittings for home workshops. KenCraft has it all! Order online, by phone or mail, or stop in – we have a lot to talk about. 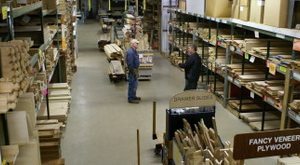 Choose from over 60 types of lumber in more than 15 species and 10 thicknesses – from thin stock to ash bat blanks and everything in between. We carry 20+ stock dust collector fittings and make custom fittings for your system. Get sheet metal wyes, blast gates, hoses, reducers and more right here. More than 50 products for any woodworking project – dowels, glue, butcher block oil, Whiteside router bits, screws, Kreg jig and accessories, CTM saw blades and much more.